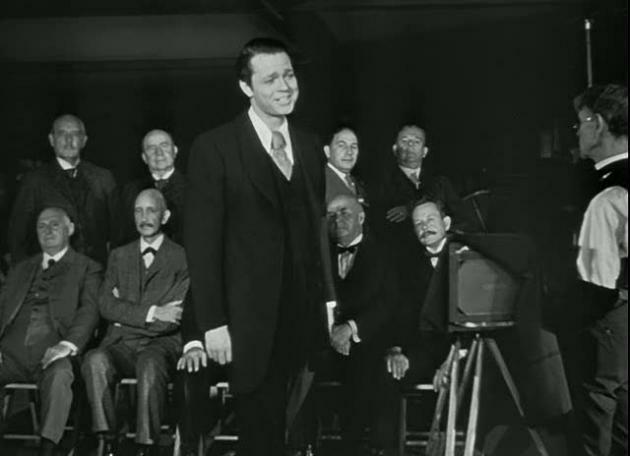 An interview with Orson Welles taped on 3rd October 1985. "He said Netflix ... had proved one thing: 'The audience wants control. They want freedom. If they want to binge–as they've been doing on House of Cards–then we should let them binge. 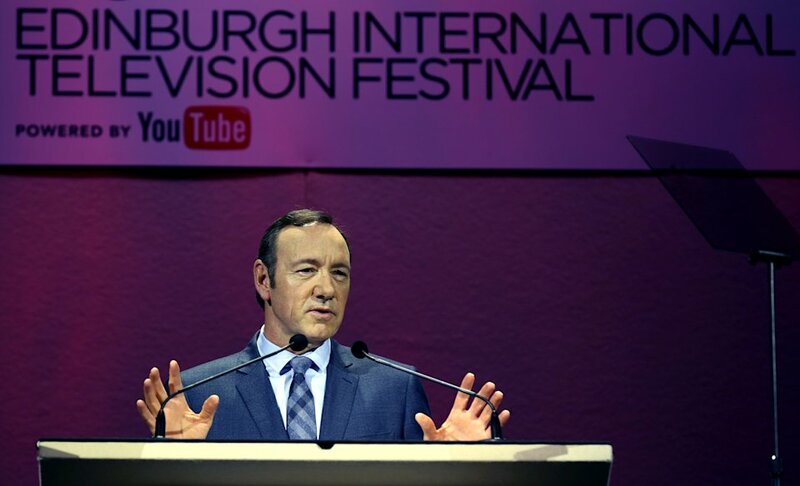 But if the medium was to continue in this rich vein, TV executives would have to adapt to the way viewers want to binge on their favourite programmes on the internet or by watching DVD box sets, Spacey said. Younger viewers no longer saw any difference between watching TV and online. 'For kids growing up, there's no difference between watching Avatar on an iPad or watching YouTube on a TV and watching Game of Thrones on their computer. It's all content. It's all story,' he said." "Another transition takes us to the same three men, this time reflected in the window of the Chronicle, Kane's major rival (Circulation 495,000). 'I know you're tired, Gentlemen... Kane begins, suggesting the men have come straight from the offices of the Inquirer after spending all night getting the paper out. 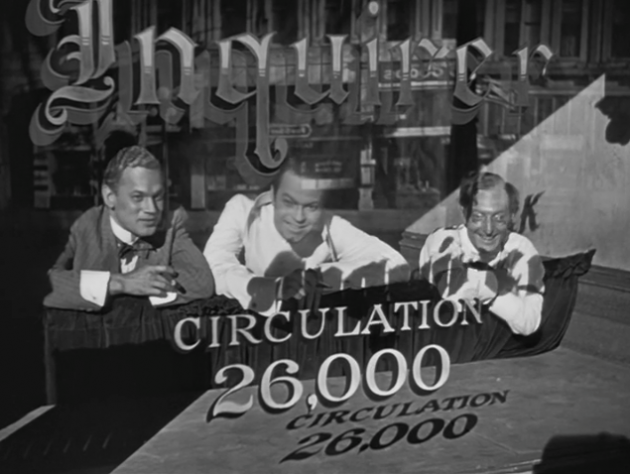 The scene not only illustrates Kane's tireless ambition, but provides a seamless transition from the humble beginnings of the Inquirer to the day, six years later, when Kane has managed to poach the entire reporting staff captured in a photograph prominently positioned in the window of the Chronicle on that first night. The camera slowly dollies in on the reporters as Bernstein tells Kane it took the Chronicle twenty years to gather such a highly respected staff. 'Twenty years?' says Kane, 'Wells' – and suddenly, as the sentence Kane speaks spans six years, the reporters are no longer still images in a photograph but moving, breathing people – 'six years ago I looked at a picture of the world's greatest newspapermen. I felt like a kid in front of a candy store.' Kane himself then enters from the left, looking prosperous and confident..."
Throughout the scene, while all this activity takes place, we can see the boy Charles playing with his sled far in the back of the image, in extreme long shot, framed by the window pane, and totally oblivious to the momentous decision his mother has made about his life. Because of the length of the shot and the careful blocking of the action, our eye is free to focus on whichever player we choose, or our attention can wander from one player to another, as if we were spectators in the theater. At the same time, the camera places us sufficiently close to the actors in the foreground of the image that we can read their expressions with much greater clarity than would be possible in the theater. 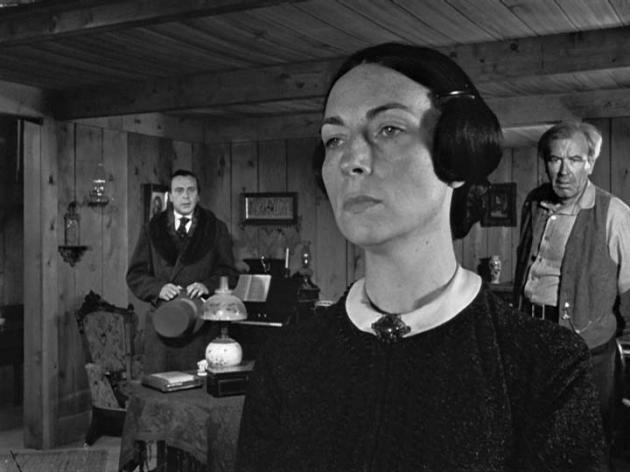 We can look for clues in the frozen but somehow anguished expression of Mrs. Kane for why she is so determined to separate herself from her son. We can wonder in observing the slightly exasperated and nervous expression on Thatcher's face what kind of guardian he will make for a young boy. Or we can observe the father's angry, worried expression and wonder why he backs down. The father's position further back in the screen space makes him seem smaller than his wife and Mr. Thatcher, his diminished size somehow appropriate to his lack of power to influence his son's fate. The crowning brilliance of the scene is the tiny image of Charles Kane far in the depth of the screen space. Although the film is about him and in later scenes he will loom large indeed, here he is a tiny speck. On first viewing the film, some may not even notice him. But his understated presence playing outside the window, shouting 'Union forever' as his mother is about to send him off into the world without her, is one of the most poignant moments in film." "Eine Zusammenstellung der besten und berühmtesten langen Kamerafahrten muss natürlich mit Murnau beginnen. Hier das Treffen des Mannes mit seiner Geliebten in Sunrise (1927)  Der Banküberfall in Gun Crazy (Joseph H. Lewis, 1950), in einer einzigen Einstellung aus dem Auto gefilmt  Die Kamera aus der Ich–Perspektive ... Madame de ... (Max Ophuls, 1953) – nach dem Vorspann ab Minute 1:50  Touch of Evil von Orson Welles (1958), mit der wohl so ziemlich berühmtesten Kamerafahrt  Godard ('Eine Kamerafahrt ist eine Frage der Moral.') und sein Weekend (1967)  Antonionis Beruf: Reporter (1975)  In den letzten zehn bis zwanzig Jahren werden extrem lange Kamerafahrten immer häufiger. Zum einen aufgrund der besseren technischen Möglichkeiten (die Steadycam gibt es seit Mitte der 70er Jahre, Antonioni musste für seine bahnbrechenden Aufnahmen in Beruf: Reporter noch komplizierte Konstruktionen zu Hilfe nehmen) – und zum anderen als Gegenentwicklung, als Ruhepol zu der immer höher werdenden Schnittfrequenz, die mit dem Musikclipsender MTV begann und jüngst mit den Batman– und Jason–Bourne–Filmen einen Höhepunkt erreicht hat. In Martin Scorseses Goodfellas (1990) folgt die Kamera Henry, wie er mit seiner Freundin über den Hintereingang einen Club betritt. Dabei wird unnachahmlich illustriert, welch privilegierte Stellung er genießt  Aus Murnaus entfesselter Kamera war zu diesem Zeitpunkt schon ein so beliebtes Stilmittel geworden, dass es Zeit für etwas Ironie wurde. Das zeigt die Anfangssequenz in Robert Altmans The Player (1992), in der sich zwei Darsteller über die besten tracking shots der Filmgeschichte unterhalten  Einige besonders kreative Höhepunkte sind seit den 90er Jahren im Genre des Hongkong–Thrillers zu finden. So in John Woos Hard Boiled (1992)  Die ersten sieben Minuten von Breaking News (2004) von Johnnie To  Ziemlich eindrucksvoll ist auch diese Szene aus The Protector von Prachya Pinkaew (2005)  Höhepunkt und Abgesang? In Joe Wrights Atonement von 2007 gerät die knapp fünfminütige Sequenz mit den Landungstruppen am Strand zu einem fast schon aufdringlichen Muskelspiel (ab 0:47)  Weitere Beispiele?" Sunrise (Friedrich Wilhelm Murnau, 1927); Gun Crazy (Joseph H. Lewis, 1950); Madame de ... (Max Ophuls, 1953); Touch of Evil (Orson Welles, 1958); Weekend (Jean Luc Godard, 1967); Beruf: Reporter (Michelangelo Antonioni, 1975); Goodfellas (Martin Scorseses, 1990); The Player (Robert Altman, 1992); Hard Boiled (John Woo, 1992); Breaking News (Johnnie To Kei–Fung, 2004); The Protector (Prachya Pinkaew, 2005); Atonement (Joe Wright, 2007).